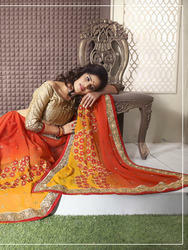 Backed by our efficient workforce, we are able to design and manufacture a wide range of Designer Sarees. 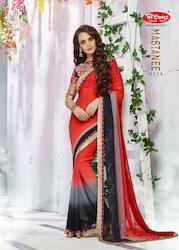 We provide Abstract & Geometric Sarees, Paisley and Kalamkari Sarees, Heavy Designer Saree, Designer Saree, Festival Range Sarees, Heavy Designer silk Sarees, Designer Range Saree and Heavy Designer Sarees, under this range. Our products are widely acclaimed by the customers for their unique patterns, stylish look and seamless finish. 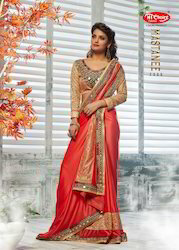 These sarees are available in different colors, designs, printings and quality at market leading prices to fulfill the demands and needs of customers.